RET identified braking energy recovery as a great opportunity to reduce the energy used by its metro system. The company has previous experience with braking energy recovery technologies. A supercapacitors- based storage system has been implemented along the tram network, but the results were below expectations. The installation was also very noisy and had to be encapsulated in a container. RET also has some doubts about flywheels. It has experienced a number of failures with an on-board flywheel system on a tram: the flywheel worked loose and destroyed the installation. The company made an assessment of this situation, taking into account the history of other energy recovery systems, investment and operational costs, space requirements and the risks of each technology. 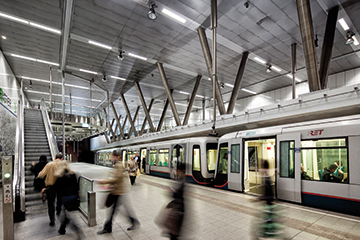 A reversible substation was seen as the best option for the metro network in the Rotterdam area. As a result, RET decided to invest in two inverters, where no storage is needed and energy can be used directly on the 10kV network. To determine the best location for these inverters on the network, a network simulation was done with different timetables. This led to the recommendation to place them on two different lines. A European tender was launched and one company was selected. The success of these two substations will determine whether RET will place new orders.